Cody Willoughby | AIM Media FFA students from throughout the Miami Valley use instruments to measure and evaluate the soil during the District 5 FFA Soils Career Development Event on Wednesday at Lost Creek Reserve. Cody Willoughby | AIM Media FFA students from throughout the Miami Valley take a general knowledge test during the District 5 FFA Soils Career Development Event on Wednesday at Lost Creek Reserve. 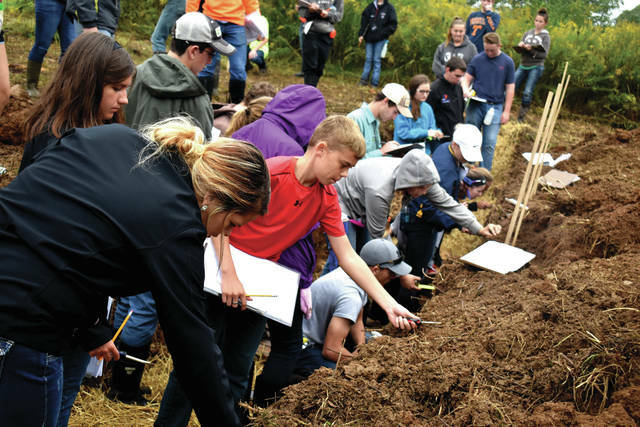 TROY — Lost Creek Reserve served as host to over 400 participating FFA students on Wednesday during this year’s District 5 FFA Soils Career Development Event. The event attracted participants from 34 school districts in Auglaize, Darke, Mercer, Miami, Montgomery, Preble, and Shelby counties. At the event, students were split into teams for rural and urban soil assessment, cycling through five stations in 20-minute increments. Stations included three soil pits that allowed students to conduct measurements and evaluations on the soil’s urban and rural soundness for use, a multiple-choice assessment to test general knowledge on topsoils, and a soil survey test, in which students interpreted a survey taken of the land at Lost Creek. 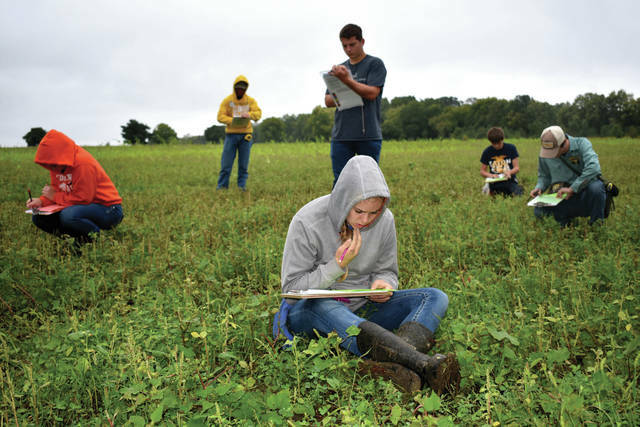 According to Miami East High School FFA adviser Marie Carity, students are able to make recommendations how to best manage facilities during their evaluations, whether the soil will be used for farming, or as the foundation for a large building. George Derringer, resource soil scientist for the Englewood division of the Natural Resources Conservation Service (NRCS), was on site to officiate the event. Linda Raterman, public relations specialist for Miami Soil and Water Conservation District, indicated Lost Creek Reserve is a terrific location to hold the event, due to its diversity of terrain and nearby resources. “For the most part, we’ve got actual lanes for walking,” Raterman said. “We have a great parking area, and there’s locations for shelter if needed. As far as different soil types, there’s a great variety on this reserve they could choose from to get good representation of the soils they need. Five urban and five rural teams at the event will be chosen to go on to the state contest, which will be held in late October in the greater Columbus area. The location will be specified in the coming weeks. Teams that make it to the state level will also have the opportunity to continue on to the national competition, which will be held in Oklahoma in May. For more information on Lost Creek Reserve, located at 2385 State Route 41 east of Troy, visit www.miamicountyparks.com. https://www.dailycall.com/wp-content/uploads/sites/30/2018/09/web1_Soils1.jpgCody Willoughby | AIM Media FFA students from throughout the Miami Valley use instruments to measure and evaluate the soil during the District 5 FFA Soils Career Development Event on Wednesday at Lost Creek Reserve. https://www.dailycall.com/wp-content/uploads/sites/30/2018/09/web1_Soils2.jpgCody Willoughby | AIM Media FFA students from throughout the Miami Valley take a general knowledge test during the District 5 FFA Soils Career Development Event on Wednesday at Lost Creek Reserve.